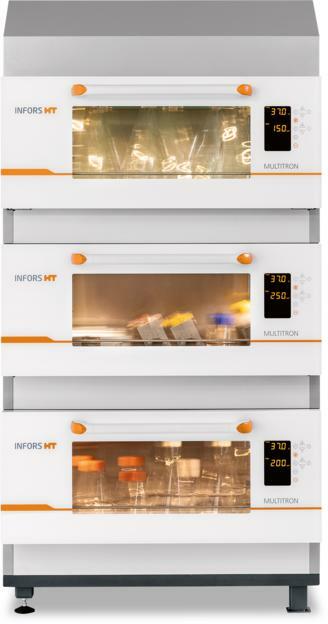 Incubationshaker Multitron - Unmatched in Space and Flexibility - - The number-one choice for reliable, convenient cultivation of microorganisms and cell cultures. 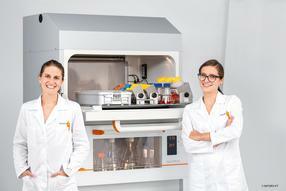 The number-one choice for reliable, convenient cultivation of microorganisms and cell cultures. 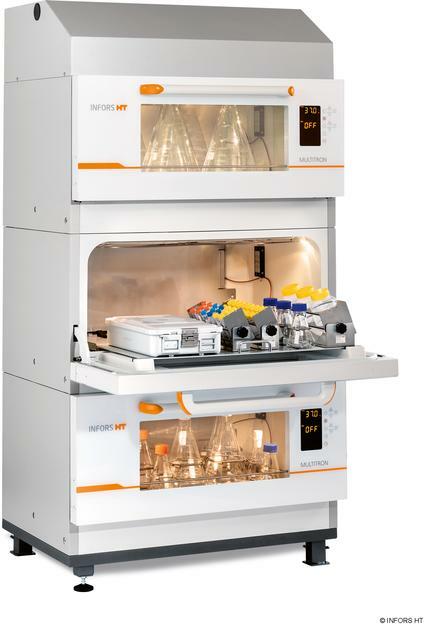 Despite its modest footprint, a triple stacked Multitron can be used for over 60 L of culture or, with its 3 mm shaking throw option conducting 23,000 experiments in parallel. Regardless of the required capacity, the top level of the Multitron is at a comfortable working height of 1,40 m.
Offering homogeneous conditions for reproducible results, the Multitron has been setting standards for temperature uniformity for decades. Thanks to its ingenious design, its precise CO2 control system is extremely efficient, and humidification produces no condensation. The practical door mechanism and the quick, automated start-stop feature keep interruptions in the cultivation process to a minimum. The Multitron allows you to pursue all manner of applications, from standard experiments with microorganisms to complex animal- and plant-cell cultivation. Its modular concept allows you to configure the shaker to your needs and select from a wide range of options, such as the right cooling. You can even upgrade your system at a later time. The eve bioprocess platform software can easily communicate with the Multitron using Ethernet. Opening up new opportunities for controlling the device and monitoring cultures inside the incubation shaker from anywhere via a web interface. You can also create customized reports and GMP-compliant process documentation.